Plus is MC Hammer, Tommy Lasorda and the Cardinal's own Tony LaRussa are using Mlblogs, then boy, I'd best get on the Mlblogwagon. Duh, nuh, nuh, nuh…U CAN'T TOUCH THIS! Juan went from the dog house to the penthouse in many of the fans minds yesterday. Not long ago Juan was being booed from the usual friendly St. Louis fans. Last night, he was being cheered, even asked to come out for a curtain call after his 2 run jack in the 3rd inning that put the Cardinals ahead 4-3. I guess that's baseball for ya. From what I've heard Juan is a streak hitter, so hopefully he can get hot for a while. Rolen was out last night with bronchitis, and I'm sure he'll probably be out of the lineup today. Hector Luna singled in the first inning with one out, then stole second base. Jose Castillo couldn't handle the throw from the catcher, which advanced Luna to third. Victor Santos proceeded to walk Albert Pujols, which brought up Jimmy Edmonds. With runners on first and third the Cardinal WPA was already 66.8%. Edmonds the brought in Luna with a line-drive single to increase WPA to 73.8%. Then Juan Encarnacion hit a ground rule double to make the score 2-0 and upped WPA to 83.1%. After a weird top of the third that included an error by Gary Bennett, and a hit by pitch, the Pirates managed to go ahead 3-2, dropping the Cards WPA to 46.2%. Juan Encarnacion then hit a homerun with one on and 2 outs to make the score 4-3 in the bottom of the third, a big jump in WPA from 42.8% to 66%, a 23.2% increase. 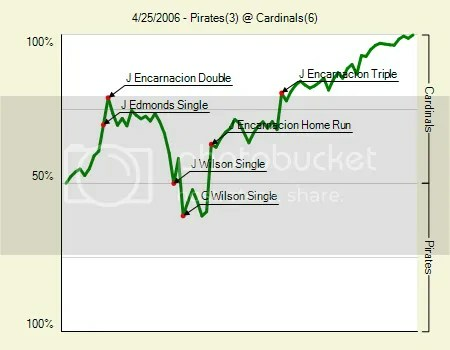 Then in the 5th inning with Pujols on first, Encarnacion tripled to increase Cardinal WPA from 71.6% to 85.4%. 5-3 Redbirds. Later on Spiezio hit a solo shot to give the Cardinals a 6-3 lead, and increase their WPA from 90%-95%. Looper and Izzy came in and iced the game 7.9% WPA between the two. Encarnacion (of course) 40.9% Finished just a single away from hitting for the cycle. MLB Trade Rumors reports a pretty interesting rumor from Gotham Baseball: The Cubs are shopping Greg Maddux. Potential suitors: Mets, Yankees, Brewers, Phillies, Diamondbacks, Royals, and…the Cardinals? Huh? I'd like Maddux, even the old version Maddux. He currently has a 0.99 ERA in 4 starts, including a recent man-handling of the home team. He's destined to fall to earth sometime, but even when he's on earth he'd look good as the #2 or #3 starter. Maddux's contract is up at the end of the season, so I sorta can see why the Cubs might be shopping him, but with the two-fifth's of the rotation in the infirmary along with Derrek Lee, it's a bit too early to be waving bye-bye to the season and going into "there's always next year" mode, even for the Cubs. I'd have to assume the Cubs would be looking for a starter who can help them now. I'm not sure we have that, outside of Reyes, and that won't happen. That would be serious Brock for Broglio karma coming back to haunt us. Also, it seems a bit strange the Cubs would deal within the division with the Cardinals or the Brewers. I'm guessing he stays put, or if he does move I think he heads West. Win Probability Added:What is it good for? 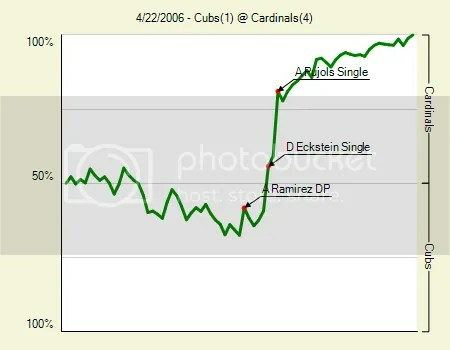 I'm sure most of you have noticed the daily "Win Probability Added" charts copied and pasted from the wonderful Fangraphs.com website. And I'm sure some of you have took a look at it, scratched your head, said "what the heck is this?" and moved on. So, let me do my best to explain what the charts mean, what Win Probability Added is, why it's good, how it's not perfect, and all that other stuff. First of all, I'm not sabermetrician, mathmatician, statician, or any other sort of "ician". But I've enjoyed baseball stats for as long as I can remember, looking at the backs of baseball cards and pouring over the Sunday sports section stat columns. I'm not sure why the fascination, but I always enjoyed that sort of thing, and when I picked up the book Moneyball, it was like a whole new world opened up to me. Since then, I've been an avid reader of publications like Baseball Prospectus, Ron Shandler and The Hardball Times. But I admit, I don't know how they come up with a lot of their complicated formulas, though I've tried. Last night, I tried to read Keith Woolner's article in BP 2005, titled "An Analytical Frameword for Win Expectancy", and while I got some of his points, I felt like I was listening to The Architect and I was a dumbed-down version of Neo who couldn't save Zion, Trinity or even $10. Anyway, on to my dumbed-down version of understanding Win Expectancy, or Win Probability (same thing.) Basically, it can be used to track the ups and downs of the game. It helps to assign value, positive or negative, that a player has on the game. Each team starts with a 50% chance of winning the game. Throughout the game there are different baseball "events." Ie, an RBI single, a sac-bunt to move the runner over, an infielder's error or a blown call by the home plate umpire. These events, depending on other circumstances like what other runner's are on base, what inning it is, etc, effect a teams percentage of winning that game. Not the most dominant outing we've seen Carp have, but he still only gave up a couple and the Cardinals got some production from the bottom of the lineup, a nice suprise. Here's how it went down, with some help from Win Probability Added percentages. Carp didn't seem quite 100% right last night, hitting Nate McLouth, the Pirate leadoff man. He then got Jack Wilson to fly out, and Jason Bay hit into a force. "Howitzer" Molina then gunned out Bay trying to steal for nifty li'l 2.3% WPA increase. Bay stole 21 bases last season, getting caught only once. Bottom of the 1st David Eckstein singles to get things started. Edmonds, batting 2nd in the lineup hit into an uncharacteristic double-play, resulting in a big decrease in WPA 62.9% to 54.6% (and 8.3% decrease) I think Jimmy hit into less then 5 dp's all season last year, and for those of you unfamiliar with WPA, hitting into DP's hurts it considerably. Albert Pujols then continued his HR tear, hitting his 12th(!) for +11.1% WPA. In the second inning, red-hot Hector Luna came to the plate with Encarnacion at second and Molina on first and no outs (74.7% WPA) That's one of the nifty things about WPA, is it takes into consideration the value of men on base w/no outs. Luna came through with a base hit up the middle, scoring JuanE to make it 2-0 Cards (84.7%WPA added) The "So" man then hit a line drive into right field to score Molina and move Luna to 3rd. 3-0 Cards (92.3%WPA) Carp went down swinging (90.2% WPA) and then David Eckstein scored Luna on the squeeze play (93.6% WPA) 4-0 Redbirds. The Bucs started to mount a comeback, with Jason Bay homering to lead off the 4th, -7.6%WPA for Carp. He then retired the next two batters, but allowed back to back singles to Joe Randa and Freddy Sanchez, which led to Humberto Cota driving in a run, making it a 2 run ballgame (+17%WPA for the Pirates). 4-2 Cards. Pujols then in the bottom of the 5th hit a double that brought home Jimmy Edmonds (89.5% to 93.9% WPA.) 5-2 Cards. Rolen then k'd, Encarnacion reached on an error and Pujols advanced to 3rd. Hector Luna then hit a line drive to score Pujols (+5% for Luna). So Taguchi hit another RBI single, scoring Encarnacion making it 7-2 Redbirds. Interestingly, WPA remained unchanged. And that's the way it remained. Carp, who didn't have his best stuff, pitched 6 innings, allowed 8 hits and two runs for +13.2% WPA. Wainwright had another impressive inning, not allowing a hit and striking out 2. Then Hancock finished it off in a fairly typical, back of the bullpen, semi-bumpy fashion. Biggest contributors at the plate: Pujols 14.9%, Taguchi 12%, and Luna 10.4%. Biggest pitch:Carp k's verses Cota with runners on 2nd and 3rd w/2 outs, 2nd inning +8.7%. Decisive inning:2nd. 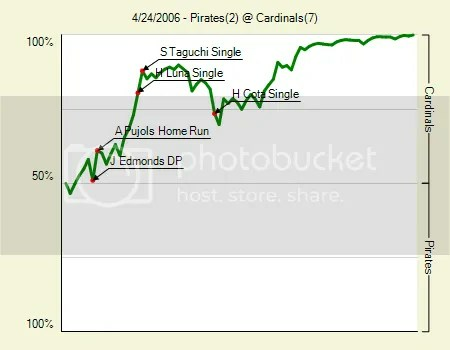 WP jumped 24.2% with timely hitting from Luna and Taguchi. It was great to see the bottom of the order contribute. I'm very happy that Luna is htting well when it matters, but it makes me wonder if it's a hot streak, or if he just truly does find a way to turn it on when it counts, or if he's just a lefty-masher, or who knows what. In the words of Elaine Benes "Maybe he's an enigma wrapped in a riddle." We won't know for sure until he sees more time, which he is earning. Pujols is just continuing his greatness, but even I'm suprised to see his power numbers so far this month. I guess we can look at that last Spring Training game when he hit 3 out is where it all began. Oh, and some of you may have noticed, Pujols seems to stopped the bat-flipping & watching-the-ball-go-out routine on his home-runs. Maybe someone said something to him, I don't know. I didn't really mind before, just found it interesting that he got rid of a habit that was drawing attention to himself and away from the team. Suppan verses Santos tonight, hopefully Supp can bounce back from last week's rough start verses the Bucs. Oh, also in another quirky AAA move along the lines of Timo Perez, the team acquired light-hitting Desi Relaford. That's not good, but it should squelch the fears of the return of Tony Womack, who was DFA'd by the Reds. With Hector hitting .393 and Miles hitting .302, it looks like at least for now we have an effective platoon at 2nd base. Stick that in your pipe and smoke it. Maddux was on the top of his game and Marquis got away from his game. Part of that was evident when Marquis threw 3 nearly identical pitches to Jacque Jones. I'm not sure how many of you saw this, but Jacque had a little smile on his face after the 3rd inside pitch, then proceeded to hammer the 4th one over the right field wall. Oh, well. It's hard to hate a guy like Maddux and it least the Redbirds took the series. The Pirates are in town, this time around hopefully the Cards can fare better against Oliver Perez then they did the last time. Things should be different with Chris Carpenter taking the mound tonight. Okay, not really. The Cardinals purchased the minor league contract of Timo Perez from the Cincinnati Reds. According to his Baseball Reference page, he's a lifetime .263/.302/.374 hitter. His page is sponsored by a baseball equipment company, which asks the question- "Timo uses Akadema gear… do you?" I'm sure Akadema is a fine producer of batting gloves and bats, but dropping Timo's name in order to sell your equipment is like dropping William Hung's name in order to sell your dance lesson videos. Meanwhile, John Gall keeps hitting in Memphis. The Cardinals have a total of 2 pinch-hits all season, and with Taguchi still struggling and Schumaker regulated to the role of a late-game defensive replacement, what are the Cardinals waiting for? Down in AA today, Chris Lambert had a good outing, striking out 9 in 6 innings while allowing 2 hits, 2 walks and no runs. Springfield Cory Doyne pitched two innings to close the game and didn't allow a run. Doyne hasn't allowed a run in all 7 of his appearances. Forgive me for being a day late and a dollar short here, other priorities going on today. On a side note about some of the action that actually happened today-Juan Encarnacion continues his streak of awfulness, the errors killed us, Marquis hung a couple and Pujols finally goes 0-fer. That's a recipe for a loss. But what can you say? Maddux was vintage Mad Dog today and it's hard to win when he's in a groove. Anyway, more on that tomorrow. Credit Scott Rolen for making two great defensive plays. 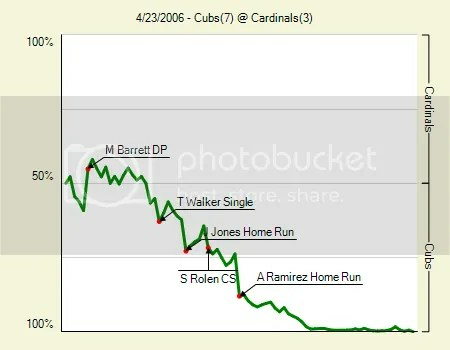 The first came in the third when Aramis Ramirez hit a hard ground ball to Scott Rolen for the second out of the inning. Rolen was able to throw out Ramirez by less then a step and the play scored Glendon Rusch. If I'm doing the math correctly, that play increased the Cards win probability by 6%. The next was in the 5th inning, with runners on first and second and one out. Ramirez then hit another grounder to Rolen resulting in a double play. 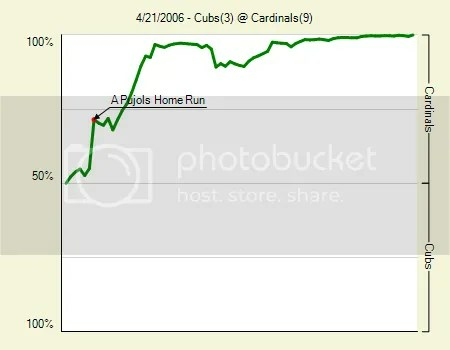 This increased the Cardinals Win Probability by almost 10%. Had it not been for the Gold Glover at third doing his thing, the game would've looked much different. The Cards then capatilized in the bottom of the same inning. After Encarwhifferon K'd, Molina popped out. But Rusch then got wild, walking So Taguchi and John Rodriguez, who pinch-hit for Ponson. Eckstein then singled, scoring Taguchi. +9% Win Probability. (48% to 57%.) Rusch then walked Hector Luna to load the bases. Big mistake-Win Probability now 63%, plus he is now facing the best hitter in baseball. Albert then singles, scoring Rodriguez and Eckstein and advances Luna to third. Win Probability goes to 85.4% (+22.4.) Molina then iced it in the 6th with a ground rule double to score Jim Edmonds from second base with one out. The trio of Wainwright, Looper and Izzy then finished it off to combine for 19.5% WPA. Ponson didn't have his best stuff to say the least, but got out of jams with some luck, his team's defense, getting the well timed grounder and good ol' fashioned Aruban guts. I'd try and chart this stuff myself in real time and have it up sooner, but A.) I haven't quite figured out David Studeman's spreadsheet yet, blame it on public education, Microsoft or whatever. Also:B.) It's a bit of work, and fangraphs.com does all the work for me. I should also give an explanation of Win Probability Added sometime soon, and talk about what it's good for and also its limitations. But for now see the article published by The Hardball Times. It spells it out far better than I can, as I'm only a Bible College grad and with 10th grade math skills and too much free time, and these guys are…well…let's just say a lot more booksmart then myself. Thankfully there's little doohickey's like the Win Expectancy Finder and places like Tangotiger.net and fangraphs out there in the deep vast beyond that is cyberspace. It wouldn't take a chart to tell you the game was all Cardinals. Albert's 2 run home run got things kicked off in the bottom of the first. The home run was Albert's 1000th hit, tying Todd Helton for the second-fastest player to reach that milestone. Then, in the bottom of the second Cubs starter Jerome Williams commited the cardinal sin of walking the pitcher with the bases loaded to score Juan Encarnacion. That put the Cards ahead 3-0. David Eckstein then singled, driving in Yadier Molina to make it 4-0 Cards. John Rodriguez hit a sac-fly to score Aaron Miles, furthering the lead to 5-0. Then Albert Pujols doubled in Mulder and Eckstein to put the Redbirds ahead 7-0, all in the second inning. The Cubs got on the board when Michael Barrett hit a three run shot in the 4th to make it 7-3. But then Jim Edmonds put the game even further out of reach in the bottom of the 5th by hitting a 2 run-shot to deep left to make it 9-3. Mulder was sharp, pitching 8 innings, allowing 3 runs, 5 hits and a walk. What's been impressive about Mulder is his sterling KK/B ratio of 7.5. But he has developed a bad case of gopheritis, allowing 5 HR in 28 innings. Maybe it's the new park, maybe he's just challenging hitters more. I'm sure he's not turning into Eric Milton, but you'd like to see him cut the homers down. Mark Mulder 4.4% (Batting) That Mulder guy keeps producing at the plate. Aaron Miles 4.1%- Drew a key walk, and drew 2 walks in the game. I thought this guy didn't have any plate discipline? Jerome Williams -37% win probability. Jacque Jones deserves mention with his 3 k's against Mark Mulder -5.2%. For an explanation of Win Probability, click here. What's also amazing is the recent home run tear Albert is on. Albert has already topped Mark McGwire for the most home runs hit by a Cardinal in the month of April, and there are still nine games left in the month, all in Albert's new favorite playground. Albert thus far has homered once in every 5.27 at bats. To put it in prospective, Barry Bonds went yard in every 6.52 at bats in 2001. There is no way am I saying Albert will keep up this insane pace and break the record, but I did have a hunch that this is the year Pujols hits 50, and it looks like he's well on his way. Edmonds has been the best center fielder in the game since 2000. He's had some impressive postseasons, including one of the most memorable home runs in the postseason in Cardinal history. He's played very well way past his prime. Sheehan says we've yet to see his decline, but I think we've begun to see it last year, though it wasn't steep. 8 Gold Gloves certainly help. Though he's never won the MVP, he's had 5 or 6 MVP caliber seasons, including one heck of a 2004.